Sometimes experiments fail miserably – in college, most memorably, it was steaming broccoli, shrimp and cheese together in a bowl to rest atop a room temperature non-toasted whole wheat English muffin. Disastrous. Putridly odored disaster. Post-knee surgery water aerobics – a lesson in humility while the old women, nearly literally, swam circles around me with their Aqua Sock adorned feet. There are others, but for the sake of my mother and father, and to prove that I do have a shred of dignity left to my name, those shall remain in the family (attempting to turn a sports bra into underwear, for example). Yes, the shred is tiny, but it is still intact. Other times, experimentation yields amazing results. While stringently strict about my meal planning and couponing spread sheet, as well as the errand circuit that takes me every single Friday without fail to the farmer’s market, Target, Trader Joe’s, Whole Foods, and Harris Teeter, I try to push myself to pick up one item throughout the trips that I’m unfamiliar with or unsure how to prepare. I like to stretch our home cooking, and thankfully, most times, Chef Davey the Hubbers has a clue. Last week that yielded: fresh fennel, taro root, fresh lemongrass and swordfish steaks. The taro has remained untouched in our produce bowl for a week now, but the others have lended themselves quite nicely to a tempo shift in the rhythm of our lives (pause for celebration, that it took me only one try to spell rhythm… a word that haunts me and typically results in 11 attempts) (also, let’s silently cheer for those cheesy orchestral references. Yay me. Yay music). Generously season both sides of swordfish steaks and scallops. While grill (or stove) is heating, heat large cast iron skillet. Add 2 T neutral oil to skillet and let heat about 3 more minutes. Add scallops. If grilling, swordfish can go directly on grates. If over stove, place in another skillet on the stove. Sear scallops 3 minutes per side, then remove from heat. Drizzle with flavored olive oil. Flip swordfish steaks while fat begins rendering out. Return scallops’ cast iron to the heat. Add butter and diced fennel until fennel begins to become translucent. Add chardonnay and cook to remove alcohol and mixture begins to thicken. Remove swordfish and fennel mixture. 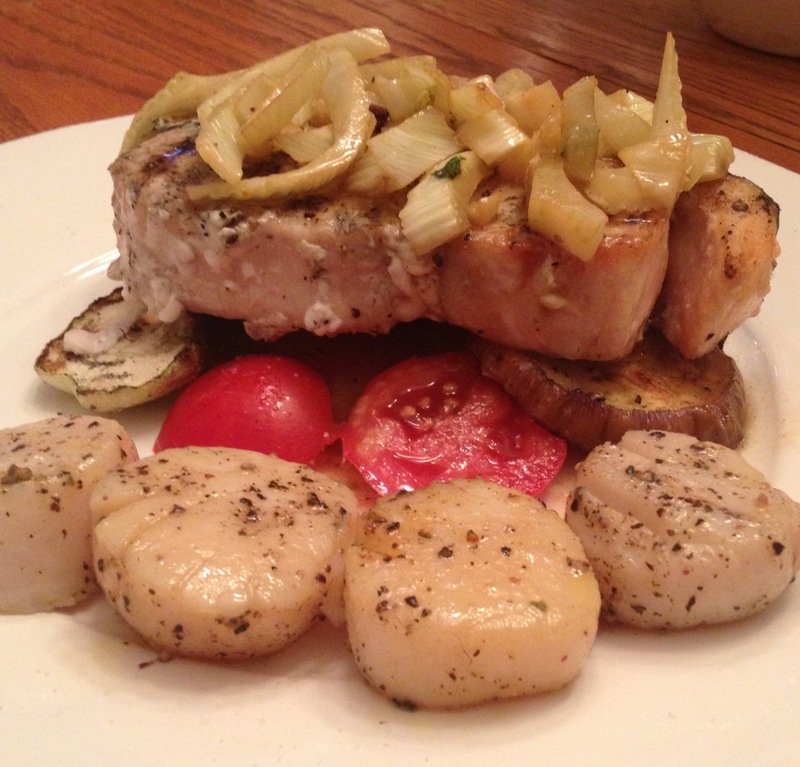 Plate swordfish and scallops and top with fennel ragout.